When not to use Malarone? Malarone is a medicine that is used to treat or prevent malaria. Malarone tablets contain two active ingredients, proguanil and atovaquone. These ingredients kill the parasite that causes malaria in the liver or bloodstream. Malarone tablets are used for preventing malaria in travellers to tropical areas. It can also be used to treat malaria in people who have already contracted the disease. If left untreated, malaria can lead to serious complications or death. Therefore, it is important to take anti-malaria tablets if you are going to a tropical area where malaria occurs. Malarone tablets should be taken with fatty food or a milky drink. Take the first dose one to two days prior to entering the malaria area. You should continue taking one tablet a day throughout your stay and for seven days after leaving the area. If you vomit within one hour of taking a dose, the active ingredient may not have been fully absorbed into your bloodstream. Repeat that dose and then go on as before. Adults and children weighing 40 kg or more: one 250-mg tablet once a day. Children weighing 11 to 40 kg: one Malarone Junior tablet (62.5-mg tablet) once a day. The treatment of malaria requires a different dose. For more information, see the package leaflet. Check the package leaflet for a complete list of side effects. Malarone interacts with other medicines, including some anti-sickness medicines and antibiotics. The doctor will have a list of medicines that you should avoid mixing it with. It is therefore important that you tell the doctor what other medicines you are currently taking. See the package leaflet for more information about contraindications. 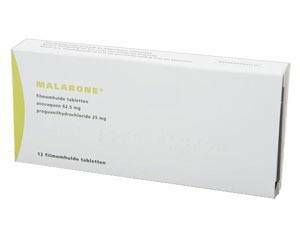 Do not use Malarone if you are pregnant or want to become pregnant. This medicine passes into breast milk. If your baby weighs more than 5 kg, you can safely use this medicine. If your baby weighs less than 5 kg, consult a doctor about safer anti-malaria treatments. Malarone may cause dizziness. Stay out of traffic if you experience this side effect.